The gun industry has boomed over the past eight years resulting in a massive increase in gun-related jobs throughout the country. 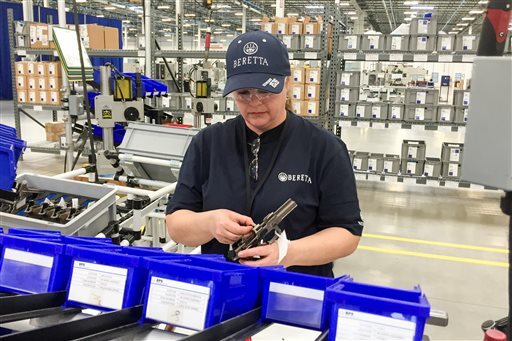 The number of full-time jobs in the firearms industry increased from about 166,000 in 2008 to nearly 288,000, according to a new report from the National Shooting Sports Foundation, or NSSF. That represents a 73 percent increase. In 2015 alone, the gun industry went from 263,223 jobs to 287,986, an increase of nearly 25,000 jobs. The NSSF estimates that the gun industry currently has a total economic impact of nearly $50 billion. That's up 158 percent from $19.1 billion in 2008. Wages in the industry rose 126 percent over the same time period. The average industry worker now receives $50,180 between wages and benefits. The gun industry has also generated record amounts of tax revenue for both the federal government and state governments in the past eight years. In 2015, the federal government collected $3.7 billion in tax revenue, an increase of 144 percent since 2008. State governments saw nearly double the tax revenue over the same period. Excise taxes are also up 92 percent. The NSSF said the industry's growth was driven by new shooters and gun rights victories in the courts. "Our retailer surveys have shown for several years that about one-quarter of the customers in their stores are first-time gun buyers," Mike Bazinet, NSSF spokesman, said. "About a third of them are now women. The Supreme Court decisions in the landmark Heller and McDonald cases reaffirming the individual right to keep and bear arms has played a role as every state now has a mechanism to issue concealed carry permits." Bazinet also said the industry has become more welcoming to new shooters and better at competing for people's leisure time. "And while self-defense may be an initial motivator in that firearm purchase, new gun owners are also seeking additional training and spending more time on the range than in previous decades," he said. "More and more ranges realize that they are in competition for peoples’ leisure time and they are better designed in all respects making them more inviting for individuals, families and friends to shoot together as a safe, enjoyable activity." Alan Gottlieb, the founder of the Second Amendment Foundation, said the gun industry's growth was a direct result of gun control advocates' push for new restrictions. "The answer is simple," he said. "President Obama, Hillary Clinton and other Democrat Party leaders push to destroy Second Amendment rights. "Their anti-rights agenda has had the opposite result. An increase in firearms ownership and record sales of ammunition and accessories." This entry was posted in Issues and tagged Barack Obama, Guns. Bookmark the permalink.